Our researchers have classified BoostWeb App as an adware application that poses a significant threat to your computer’s security. It is recommended that you remove this infection in order to ward off other malware from entering you computer, because BoostWeb App is known to promote fake websites that contain links to malicious websites. The infection comes as a browser extension, but it also installed as a Windows program. The malicious extension is compatible with the three most widely used web browsers: Internet Explorer, Firefox, and Chrome. This article also contains a guide that will help your remove this infection manually. BoostWeb App has its own promotional website at Boostwebapp.com, which is pretty much useless as you cannot get infected with the malware from it even if you wanted to because the download button does not work. However, it does not mean that you are in the clear. The adware is known to be distributed via freeware bundles featured on websites, such as Brothersoft.com. Note that you can choose not to install BoostWeb App, because most freeware sharing websites make their installers with custom installation settings. So you can remove the infection by opting for custom installation and unchecking a certain checkbox that offers you to install BoostWeb App. 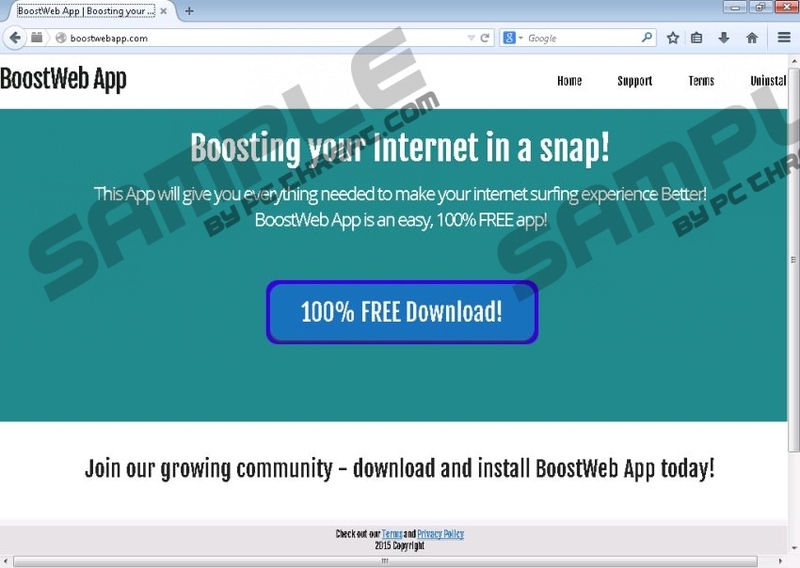 BoostWeb App’s slogan is “Boosting your Internet in a snap!” The website claims that the application will give you everything you need to make your internet surfing experience better. Well this is just laughable. There is no way this infection can possibly enhance anyone’s browsing experience by bombarding them with third-party advertisements. You should remove this application, because the advertisements promoted by it are mostly supplied by shady advertisers who engage criminal activities. BoostWeb App may very well be used to promote ads of malicious websites that contain links to malware downloads. Indeed, your computer may be infected with Trojans, rogue applications, and other malware simply because this seemingly insignificant infection was not removed. Therefore, we recommend that you remove BoostWeb App if you don’t want your computer getting infected with extremely dangerous malware, which will be very difficult to root out. You can remove this infection manually, but our researchers also recommend that you get a powerful anti-malware scanner such as SpyHunter that immediately detect all security threats no matter how great or small. Move the mouse cursor to the lower left corner of the screen and click Start Screen icon. Move the mouse cursor to the lower left corner of the screen and click Start. Find BoostWeb App and click Uninstall. Move the mouse cursor to the lower left corner of the screen and open the Start menu. Remove BoostWeb App and click Close. Quick & tested solution for BoostWeb App removal.